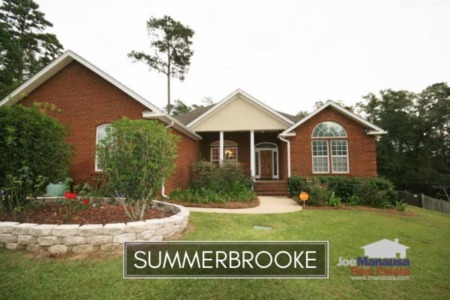 Over the past year, I had the opportunity to meet with two different homeowners to discuss Summerbrooke home sales. Their stories were similar and their needs were similar, and each felt that their individual home was worth more than I felt the market would bear. Now understand that these are highly educated people and they were presented with what I feel is solid market feedback about Summerbrooke home sales and home values. This is just more anecdotal evidence that the emotion of selling a home is often far more powerful than any level of formal education. Ultimately, one followed my advice (sell fast to get the highest price in a declining market), while the other chose to work with a real estate company who was willing to market the home at a price higher than what buyers are willing to pay. Both no longer live in Summerbrooke, yet one still owns a home there. My clients received an offer on their home and closed on it within three months of our first meeting, while the other home still remains un-sold. The sale for our client remains as one of the highest values received in Summerbrooke for more than a year (meaning they did not "give the home away"). 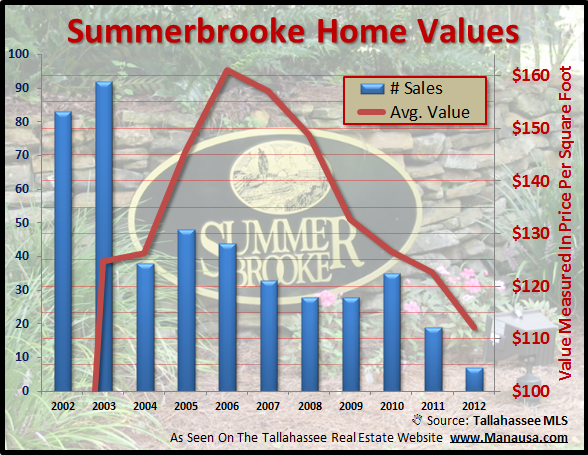 Since the first meeting, Summerbrooke home sales have continued to slide, and values have dropped even more. I no longer would be able to sell either home at the values I presented to them in the past. There are currently 33 homes for sale in Summerbrooke (nearly two years of supply) and we continue to see asking prices drop. If you are thinking about selling a home in Summerbrooke, waiting could be very costly. If you want to analyze your situation and review smart courses of action, simply contact me today and we can schedule a time to discuss your specific needs. If you are thinking about moving and need to sell a home, take a lesson from these two different homeowners. One chose the harder, correct path and solved his problem. The other continues to live in denial and hope that the market will change for the better. I find it sad that people allow their homes to own them, when in many cases it just doesn't have to be this way. 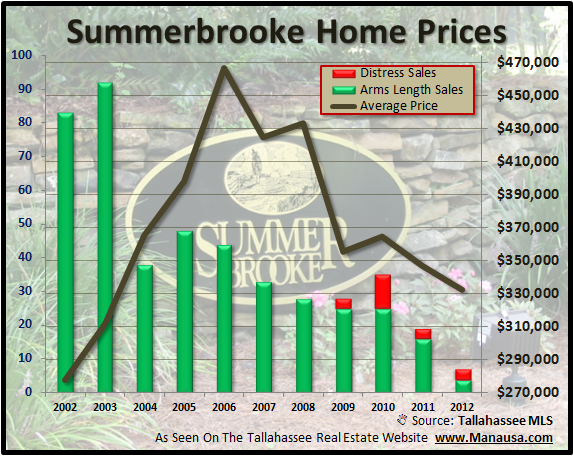 The average Summerbrooke home sales price has dropped from $466,000 in 2006 to just $332,000 in 2012. In 2006, $466K would buy you a 2,894 square foot home, whereas today the $322K would buy you a larger home (currently averaging 2,962 square feet). As you can see from the vertical bars in the real estate graph below, nearly 1/2 of all Summerbrooke home sales this year have been short sales, foreclosures, or bank owned properties. Summerbrooke home sales have recorded value declines of 30% since the peak of the market, which is just below market average. But when we compare Summerbrooke with it's closest Golf Course Community neighbor, Golden Eagle home values have only declined 24%. This next graph looks at Summerbrooke home sales each year from January through May. This means that zero seasonal affects are registered in the graph, and a picture is truly worth a thousand words. 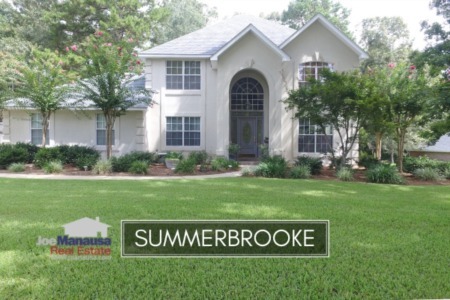 The following is a list of closed Summerbrooke home sales recorded in the Tallahassee MLS. Thanks for stopping by and viewing another Tallahassee neighborhood report. 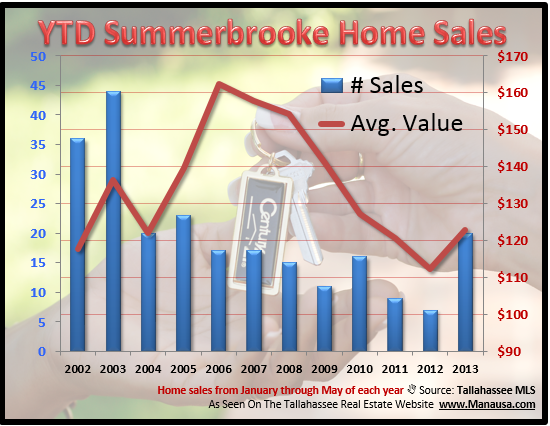 Please check back from time to time as we analyze other subdivisions in Tallahassee (including updates on Summerbrooke home sales).